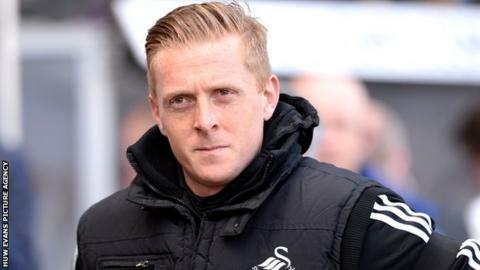 Head coach Garry Monk says he will not consider his own future until Swansea City secure Premier League survival. Monk was appointed for the "foreseeable future" following Michael Laudrup's dismissal in February. Swansea's 2-1 win at Newcastle saw them edge closer to Premier League safety but Monk believes there is still work to be done. "We are not secure. It's not mathematically done yet," said Monk. "When that comes about, I am pretty sure that is when I will be able to sit down with the board and see what the future is." The former club captain, who joined Swansea in 2004, has said previously he wants the manager's job on a long-term basis. But the 35-year-old former Southampton defender is, for time being at least, focused on his side's final three games of the season, starting with Saturday's home game against Aston Villa. The future for me was always to go into coaching and management. Who wouldn't want to do a job like this? The Swans go into the contest six points clear of the relegation zone with games at home to Southampton and away to Sunderland concluding the season. "It's far from over for us. If we go into these three games and we don't get any points and the other teams win, then we are relegated," Monk added. "When it is mathematically done, that is when I can sit down with the chairman [Huw Jenkins] and the club and see what the future is and what their thinking is. "The future for me was always to go into coaching and management. Who wouldn't want to do a job like this?" Michu, Swansea's top scorer last season, has been ruled out of Saturday's match at the Liberty Stadium. The Spaniard was sidelined for three months with an ankle problem and, although he subsequently returned to action, swelling around the joint is now keeping him out. But Monk hopes to have the former Rayo Vallecano player back before the end of the season. "We can't quite seem to get the swelling down. It's really small margins," Monk added. "Along with our medical department, he has travelled to Spain to see the national doctor for information from him. We will know more today."